EVEN BETTER - Now available WITH POWER to charge your devices. This LEVO is loaded with several features, like our quick-lever height adjustment locks, a handy micro adjustment, a heavy-duty structure, a lustrous anodized aluminum finish, quick release platforms for interchanging tablets and books (Book Platform sold separately), and adjustable tension in each movement. WEIGHT FOR IT - For stability and security, this LEVO Tablet Floor Stand incorporates a substantial counterbalance that our users love! You'll be glad to know your device is safe from a catastrophic crash to the floor, as this LEVO's 20 pound base provides unsurpassed sturdiness. Good thing it's on wheels, so you can easily roll it throughout your home or office. FEATURE CRAZE - Why so many features to hold such a small device like a tablet? Your tablet is a serious device that brings the world to your fingertips. But, you can't experience its full potential while it's glued your lap, stuck resting on a table top, or swaying on a cheap stand. LEVO floats your tablet or eReader at the perfect height and angle while you sit, recline, or lie in bed. You simply get cozy, then swing, yaw, and tilt your device into perfect position. Place your device horizontal, upside-down, or anywhere in-between. DON'T DITCH YOUR CASE - Our simple and quick tablet mounting is compatible with all iPads, tablets, and eReaders with or without cases. Quickly spin from portrait to landscape so you can view your pages or photos at their optimum angle. EVEN BETTER - Now available WITH POWER to charge your devices. This LEVO is loaded with several features, like our quick-lever height adjustment locks, a handy micro adjustment, a heavy-duty structure, a lustrous anodized aluminum finish, quick release platforms for interchanging tablets and books (Book Platform sold separately), and adjustable tension in each movement. WEIGHT FOR IT - For stability and security, this LEVO Tablet Floor Stand incorporates a substantial counterbalance that our users love! You'll be glad to know your device is safe from a catastrophic crash to the floor, as this LEVO's 20 pound base provides unsurpassed sturdiness. Good thing it's on wheels, so you can easily roll it throughout your home or office. FEATURE CRAZE - Why so many features? For the ultimate hands surfing experience without a kink in your neck. 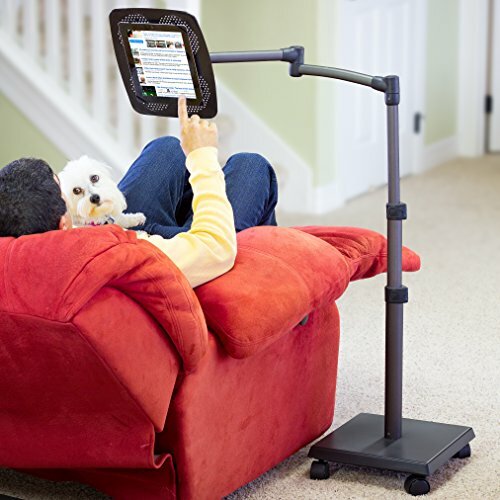 LEVO floats your tablet or eReader at the perfect height and angle while you sit, recline, or lie in bed. You simply get cozy, then swing, yaw, and tilt your device into perfect position. Place your device horizontal, upside-down, or anywhere in-between. DON'T DITCH YOUR CASE - Our simple and quick tablet mounting is compatible with all iPads, tablets, and eReaders with or without cases. Quickly spin from portrait to landscape so you can view your pages or photos at their optimum angle. TAKE COMFORT - LEVO's 5 axis swing-arm quickly swings and folds when not in use, or when you're ready to exit your furniture. When you return, you can quickly swing your tablet back into position so you can continue surfing in deluxe style anytime! SURFs UP - You can even roll LEVO throughout your home so you can surf in bed, in your favorite chair, or in your kitchen. If you have any questions about this product by Levo, contact us by completing and submitting the form below. If you are looking for a specif part number, please include it with your message.